I have always loved black and white photography and this is a great example I came across the other day; the photo is by gary.ell and the original can be found on Instagram here. CORRECTION: This is clearly not Willingboro as this Futuro has the standard number of windows and not the reduced number seen in the Willingboro Futuro. How observant I am! Now I have to figure out which Futuro this is. 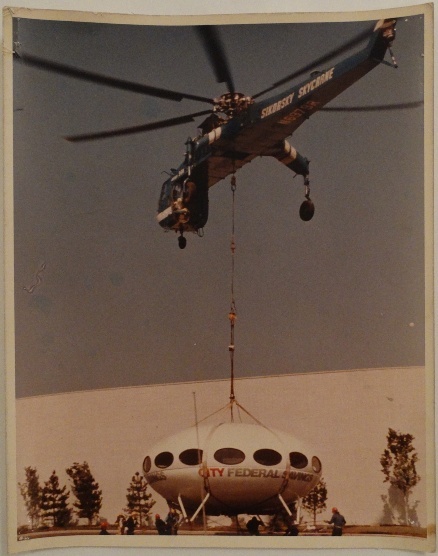 This vintage 8" by 10" photo, added to my collection of "Things Futuro" this week, shows what is likely this Futuro being delivered by Sikorsky S-64 Skycrane to a mall in Woodbridge, New Jersey in 1972. The photo does not carry any identifying marks either front or back. These photos were shot 110814 by Alasdair King; the photos are high res and they include two photos of the interior of the Futuro. My thanks to Alasdair for sending me these photos. 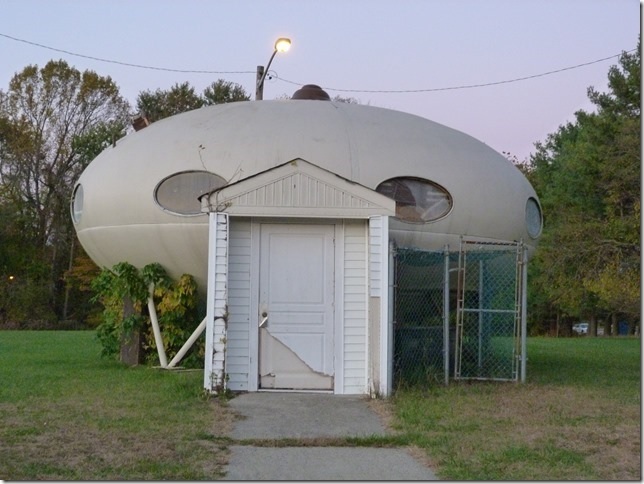 These two photos were taken 103014 by Pam Petrone and provide an updated look at this Futuro. My thanks to Pam for sending me these photos. Embedded below is a video that was shot by Dan Reed on 071913 - thanks for letting me know about the video Dan. 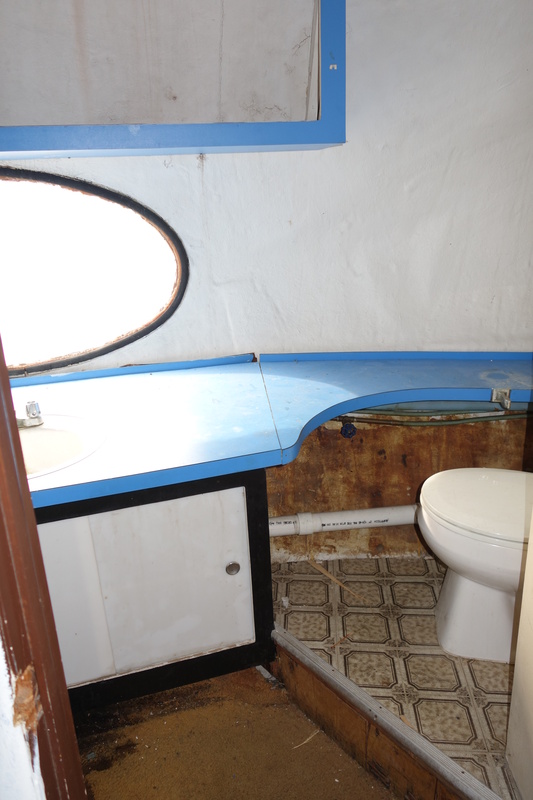 The video clearly shows that the condition of the unit is deteriorating. Dan's video ends with the statement "Someone must save it." I echo that sentiment - I wish I were better placed personally so that I could do something about it myself but unfortunately I do not have the resources. 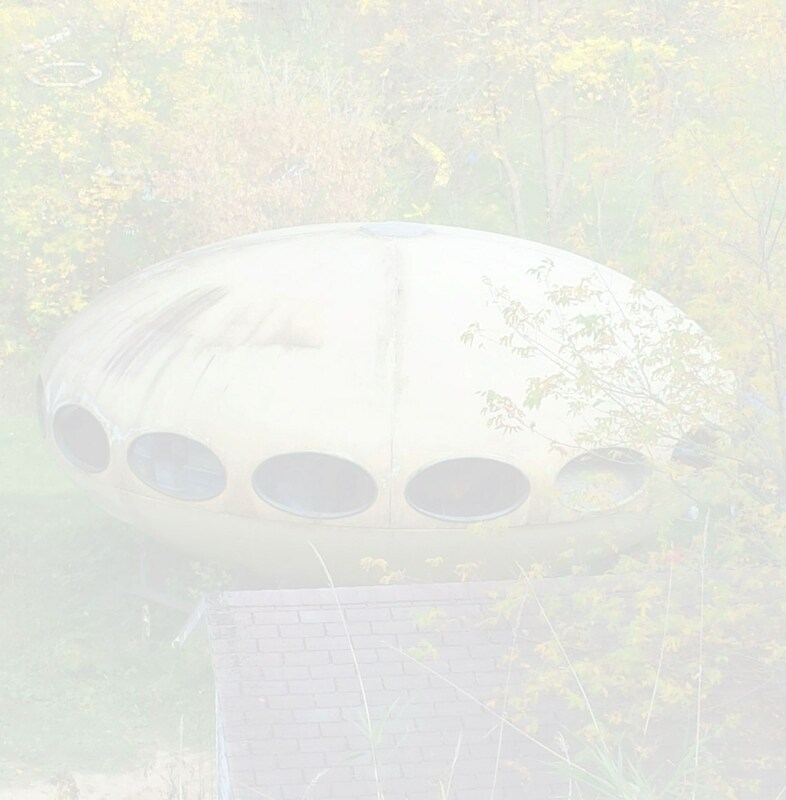 The video below is by "The Unknown Cameraman" - the footage appears to be a composite of footage from Vernissage TV showing the Museum Boijmans Van Beuningen Futuro, the Greenwich Futuro and this Futuro in Willingboro. The Willingboro footage starts at 03:13. At one point in the commentary the video indicates the footage has been taken at various points in New Jersey - clearly the Vermissage TV footage was not shot in New Jersey. Dennis McDonald, Staff Photographer at the Burlington County Times kindly sent me this photograph of the Futuro being landed in the Village Mall parking lot in Willingboro on 121473. The photograph is reproduced here courtesy of the Burlington County Times. PC Rider photo blogs about his travels on AdventureRider.com. In a post dated 071711 PC Rider included the following photos of the Futuro which include a cool shot of the interior. Since there is snow on the ground the photos must have been taken sometime before the post. Though not strictly a photo Bing Map's gives a nice "bird's eye" view. 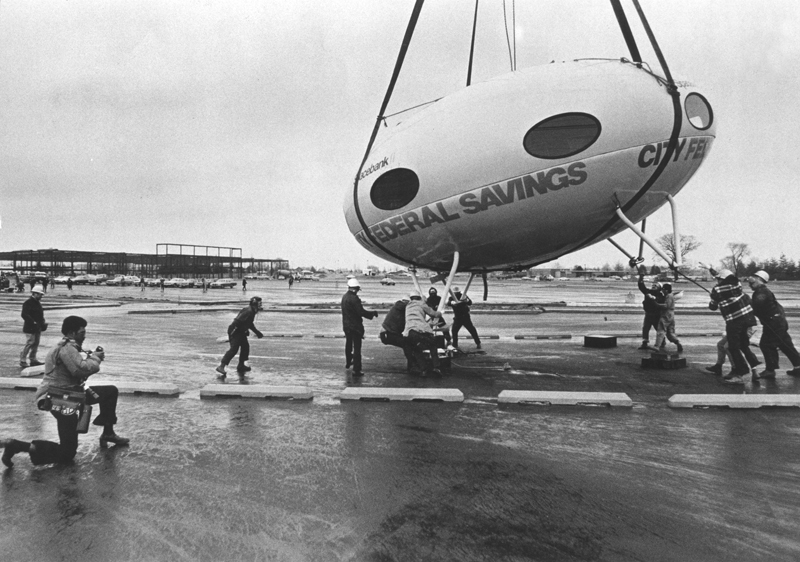 The video below shows the delivery of a Futuro House by air to a Mall in Lakewood, NJ where it was to be used a branch of the City Federal Saving Bank in the early 70's. 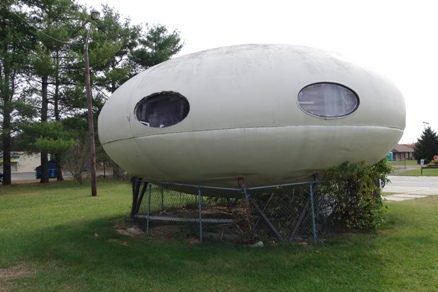 I believe that this is likely the Futuro now located in Willingboro but I cannot be sure. This video, narrrated by a local, shows the Futuro as it was 071312. 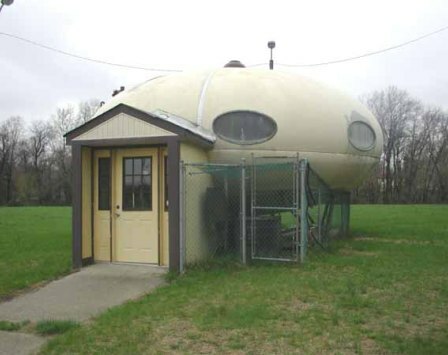 The 091576 issue of the Cherry Hill, NJ publication the Courier Post carried an article on this Futuro titled "It's not an invasion, just a new office". The article, which is accompanied by a single photograph, reported on the official "dedication" of the structure as Willingboro Township's Parks Information Office. The structure had actually been moved [by flatbed truck] to Mill Creek Park in Willingboro many months prior in November 1975 but local authorities had not previously got around to scheduling the dedication. 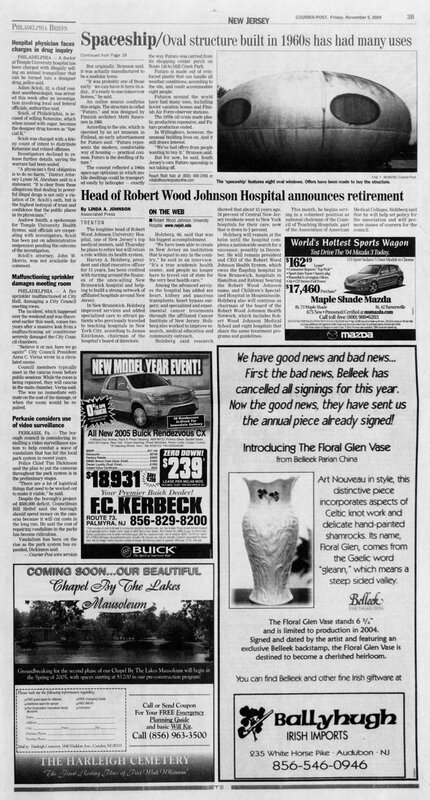 An issue of the same publication almost thirty years later [see the see the 120416 update below] suggested that the move to Mill Creek Park was facilitated by a helicopter. Such confusion is not unusual where the history of Futuros is concerned and when I came across this article it seemed more likely that is was correct being written at the time. 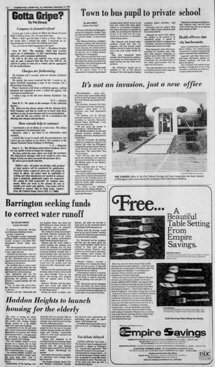 The history of the "Space Banks" seen around New Jersey in the early 1970's has always intrigued me and as a result of reading this article I decided to put together a history of them, as best I could based on the available information, which was also added to the "Concept & Design" page today. That work confirmed what I believe was the most likely history of this Futuro which saw it installed 033173 at the Lakewood Shopping Plaza in Lakewood Township, New Jersey and then later in the parking lot of the Village Mall in Willingboro Township, New Jersey on 121473. In November 1975 it was moved by flatbed to its current location. 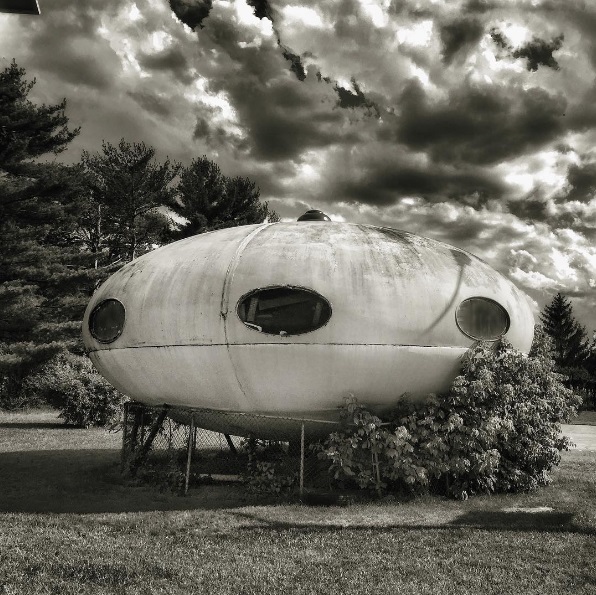 The 110504 issue of the Cherry Hill, NJ publication the Courier Post carried an article on this Futuro. 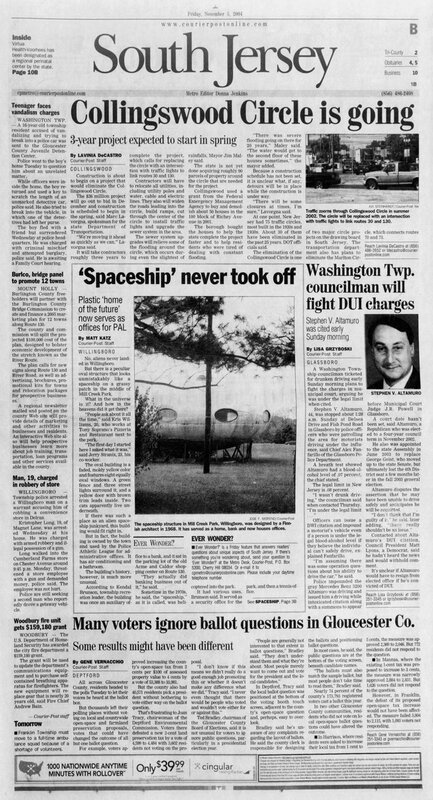 The article appeared on pages 1B and 3B under the headline "Spaceship never took off" and is accompanied by two photos. 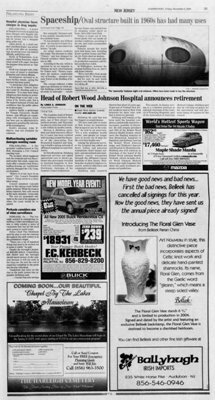 The article tells us that [at the time] the Futuro was owned by the town and used as an office by the Police Athletic League. 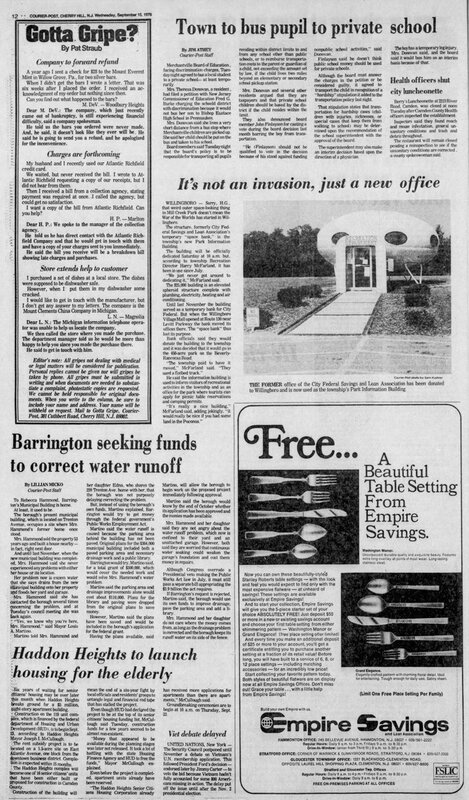 The article adds a little history reporting [and thus confirming] that this Futuro was once a banking office located in the parking lot of the Acme & Caldor shopping center on Route 130. 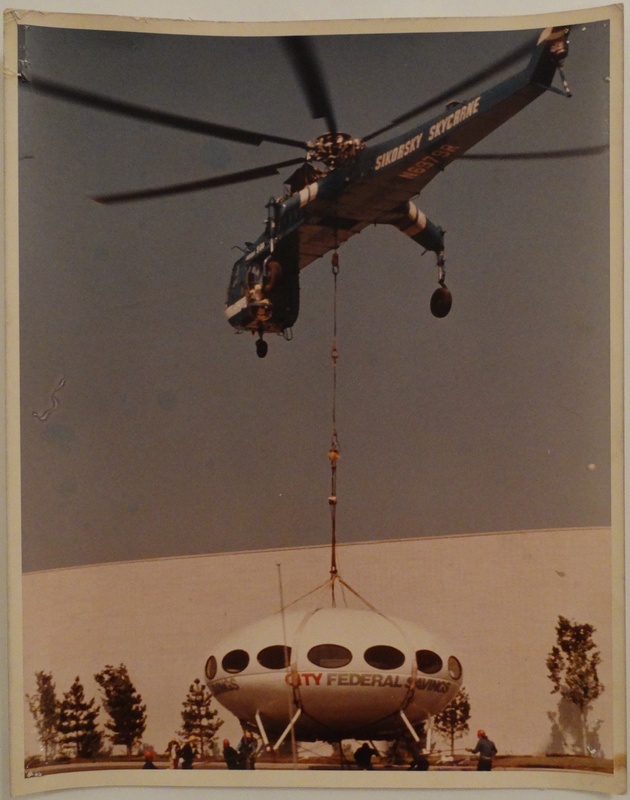 It was flown into Mill Creek Park by helicopter sometime in the 1970's where it served as a security office for the park and then a tennis office prior to being taken over by the Police Athletic League. So; it seems the puzzle might not be such a puzzle after all. We know the Futuro was originally used by a bank and so it seems likely that for that reason it was built with fewer windows. Though not stated as a reason in the document it seems not unreasonable to assume that the design change was aimed at enhancing security. 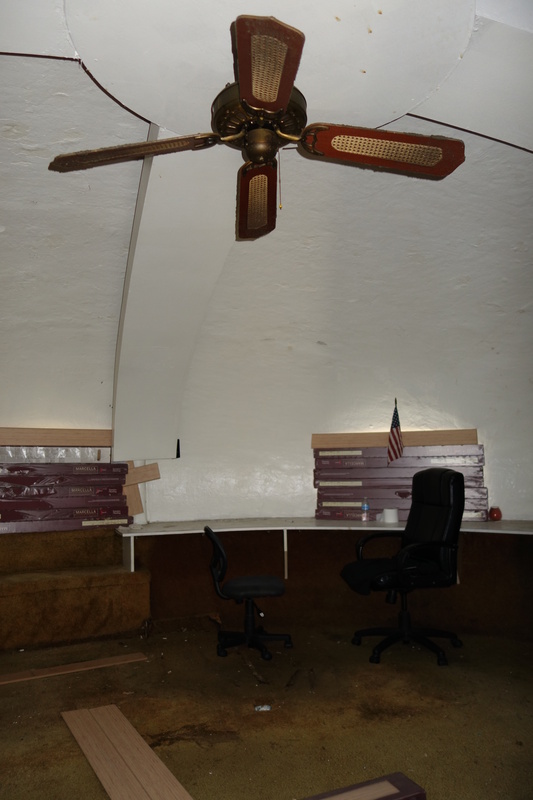 I am now wondering of the Covington Futuro also served duty as a "Spacebank" at one time. Though nothing I have found to date indicates such a past life it might explain why that unit is also constructed with fewer windows than normal. 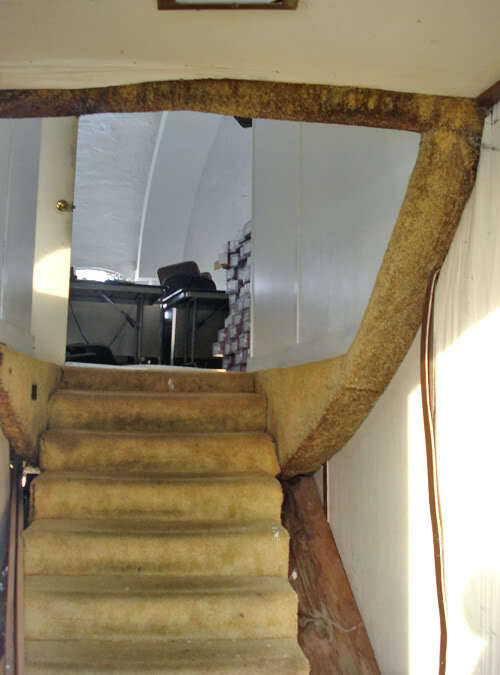 An interesting article by Dennis McDonald was posted on phillyBurbs.com July 19th 2012. 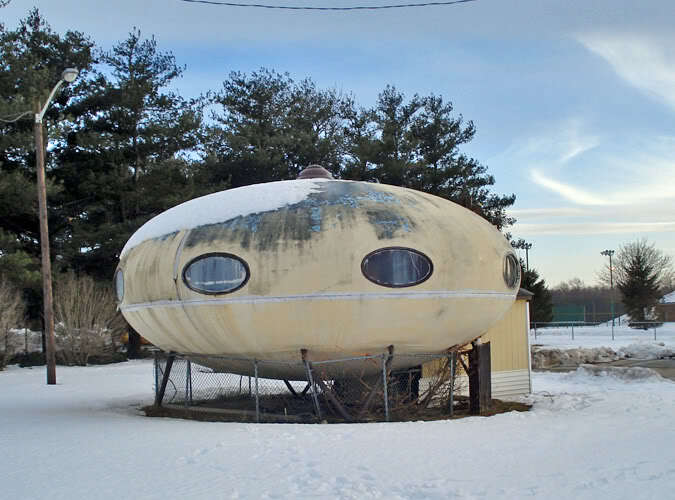 Based on that article it is now evident that this Futuro was in fact the one that spent time in Lakewood, Ocean County AND that it also spent time in the parking lot of the Village Mall in Willingboro [arriving on that site 121473]. 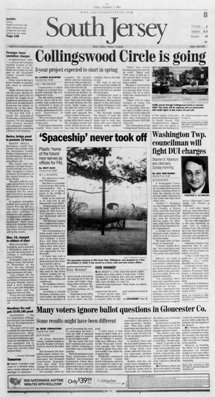 In his article McDonald writes that according to an article in the Burlington County Times the "Spacebank" was open for business within 30 minutes of landing in Willingboro with "space-suited guides on duty". 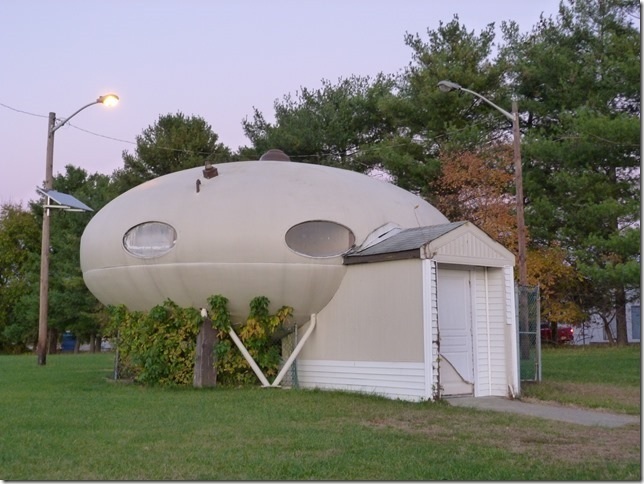 After several years operating as a bank the Futuro was abandoned and then donated to Willingboro township. In the 35 years since the building has been used as office space by township park guards, the recreation department and the local Police Athletic League. 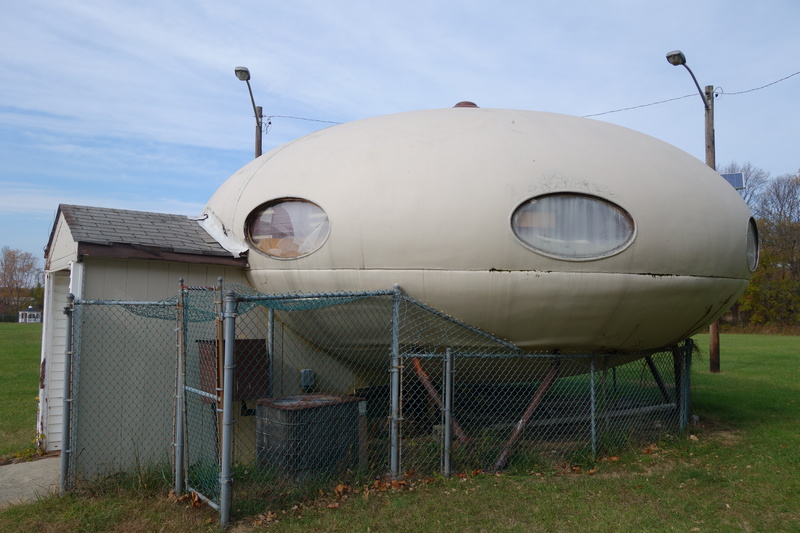 This Futuro is interesting in that it appears to be different from many others; it appears to have fewer windows that most though there are others that look similar [Covington for example appears very similar]. For a while I wondered if this was even a Futuro and not some very similar creation but based on all of the research I have done everything points to it being a Futuro [including it being the correct size] and so until I find something to the contrary a Futuro it is. It appears that this example has moved several times; I cannot find an actual date when it arrived at it's current location but historical imagery in Google Earth places it on site as far back as 1995. Danielle Burrows indicates in a blog post [Dead link - see pdf here] that this Futuro was in the past [early 70's] used as a branch of the City Federal Savings Bank elsewhere in Willingboro. I am wondering if in fact it is the one that was used as a bank branch in the Lakewood, New Jersey in the early 70's. Film Director Mika Taanila directed a music video in 1998 for Ektroverde's track "Inauguration of a Spacebank" and the video features footage shot in 1972 by Samuel Samson of a Futuro being flown in to what does indeed appear to be a Mall parking lot. That Futuro does feature the same smaller number of windows than normal and it is also clearly identifiable as being for the City Federal Savings Bank. 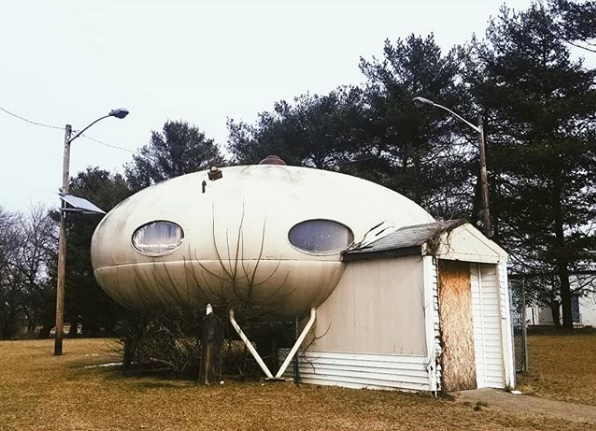 I can find no evidence of two Futuro's being used in this way so perhaps the one currently in Willingboro was the one from Lakewood or maybe there were two and I have just found no evidence of that. 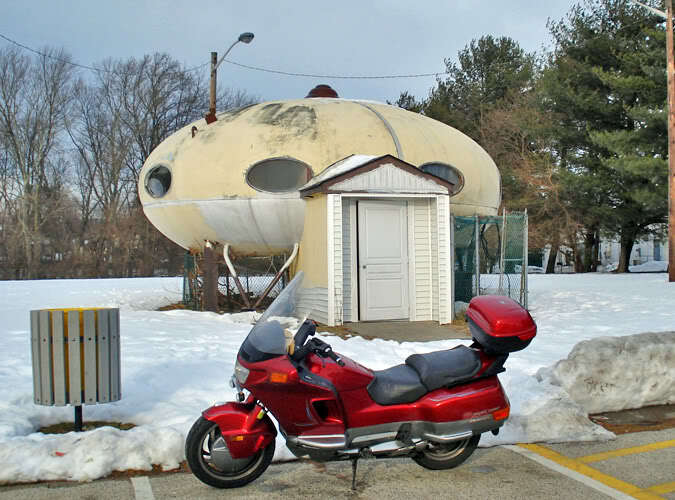 So; if you know anything of the history around this Futuro [or two if indeed there were two] I would love to hear about it. This photograph by the meshellayoubella taken 030819.